Next time you decide to go camping, you may want to leave your cologne and lotion at home. However, it’s not just sweet smelling specimens that attract these biters. Mosquitoes also love the smell of sweat, dark clothing and maybe even your blood type. Fortunately, we can repel mosquitoes without coating ourselves in toxic chemicals. If you’re looking for natural mosquito control, you’ll want to follow this rule: If you can’t pronounce the ingredients on the back of a label or it sounds like a chemical compound, it’s probably not natural. For instance, can you pronounce any of these words on your first try: picaridin, methylpropyl, hydroxyethyl, piperidine carboxylate? Not so easy, eh? These were some of the ingredients we found in common name brand mosquito repellents. We’re not suggesting that you should never put these on your skin, but we are saying that if you’re looking for organic, natural mosquito repellants, you should probably put the bottles down that include these ingredients. DEET is a popular ingredient found in insect repellents and does a great job at keeping biters away. Some believe that DEET is toxic and shouldn’t be used on the skin, while others think it’s just fine because it’s been around for 50 years. If you want to learn more about DEET, we recommend reading these myths and fact about DEET. If you’re traveling to a geographic location with a high risk of mosquito-borne illnesses, such as Zika, West Nile virus, malaria, dengue fever, yellow fever, elephantiasis, etc., you should carefully weigh the pros and cons of using DEET (the most effective ingredient against mosquitoes). Using this toxic ingredient from time to time may be worth the risk when compared to the very high risks associated with these serious illnesses. 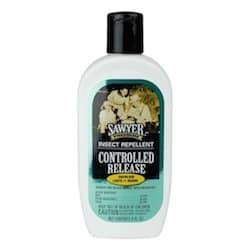 If you’ve opted to use a bug spray with DEET but are seeking a safer solution than the traditional brands, we recommend Sawyer Products Premium Controlled Release Insect Repellent Lotion. Two of our team members went to Trinidad to build houses with Habitat for Humanity, and their research found this to be a reliable and safer choice (even for kids) when faced with the risks of Zika and Yellow Fever on the island. Bonus: it keeps working for 11 hours! It’s what we used and worth your consideration in heavy mosquito zones (also protects against ticks). Below are our picks for the best natural mosquito repellents. If you want to make your own homemade mosquito repellent, skip down below. And don’t forget to check out some plants you should have around if you want to deter those pesky critters from your home and yard. EcoSmart’s Organic Insect Repellent is our top pick for best natural mosquito spray. In fact, this is the product that our team uses when hiking and spending time outside. We love that it repels a variety of bugs with a gentle lemongrass, rosemary and cinnamon scent vs. the normal toxic odor associated with bug spray, thanks to the essential oils included in the formula. This spray soaks in quickly, so you don’t have to worry about sticky or shiny skin. It doesn’t contain any harmful chemicals, making it completely safe around kids and animals. We did read some reviews that the smell wasn’t favorable or that it sometimes doesn’t work well, but overall it has more favorable ratings than not. Our team and many other loyal users swear by it. BugMace is our #2 pick for the best natural bug repellent because of its high reviews from customers and natural, organic ingredients. BugMace natural bug spray claims to repel mosquitoes, ticks, biting flies, gnats, no-see-ums, chiggers, ants and fleas. It has a 100% guarantee to help repel mosquitoes, and if you’re unsatisfied, they’ll refund your entire purchase price, which we think is a great policy. BugMace is made with recyclable materials, and it’s biodegradable and eco-friendly, which is why it’s in our top three. The biggest complaint is that it has a strong scent, so if you’re sensitive to lemon or vanilla, you may not like this repellant. Rounding out our top three for its 100% natural formula is Skedattle. The three main active ingredients in this repellant are all plant-based oils: citronella oil, lemongrass oil and peppermint oil. Citronella is known for being a natural insect repellent. Lemongrass is also good at repelling mosquitoes and becomes even more effective when combined with other essential oils, including peppermint, to create a strong scent that irritates bugs. Why didn’t Skedattle rank higher? Some buyers complain about defective bottles, and a small percentage say the repellent didn’t work. Below are some homemade options for organic mosquito control. You may have many of these items at home, so you may not have to spend any money. Apply vanilla extract or vanilla essence to your pulse points. Rub lavender flower behind your ears, wrists and neck. Combine 1 part lemon eucalyptus oil and 10 parts sunflower oil or witch hazel in a spray bottle. Shake and spray. Combine 1-1/2 T water, 1 t castor oil, 8 drops rosemary essential oil, 8 drops lemongrass essential oil and 4 drops geranium essential oil in a 2 oz amber spray bottle. Shake and spray. Mix the following in a spray bottle: 6 oz witch hazel, 2 oz castor oil, 5 drops cinnamon oil, 15 drops eucalyptus oil and 15 drops citronella oil. Shake and spray. Below is a list of plants that repel mosquitoes. You may want to consider having these mosquito-repelling plants around to get rid of those pesky pests. Did you forget to reapply your bug spray? Don’t we all?! Bug bites can be immensely itchy and uncomfortable. Fortunately, there are seven easy steps to get rid of your bug bites sooner. Watch the video below to stop itching now. You can also apply a drop of lavender essential oil to calm the itch. No matter what insect repellent you choose, it’s important to use it properly. Be sure to read the instructions carefully. As a general rule, you don’t want to spray the repellent on your hands because you could risk getting it in your eyes or mouth. You’ll also want to shake repellents vigorously to make sure the ingredients haven’t separated. When it comes to being green with what you put on your body, it doesn’t stop at mosquito repellent. Sunscreen can be dangerous as well as toothpaste. Do you use DEET bug repellent, or are you anti-DEET? Why? Triclosan Dangers: Does Colgate Cause Cancer?